Putting the Swing Back into Golf! Teaching Mum: Destroyer of Dreams. Teaching Mum: Re-animator of Dreams. 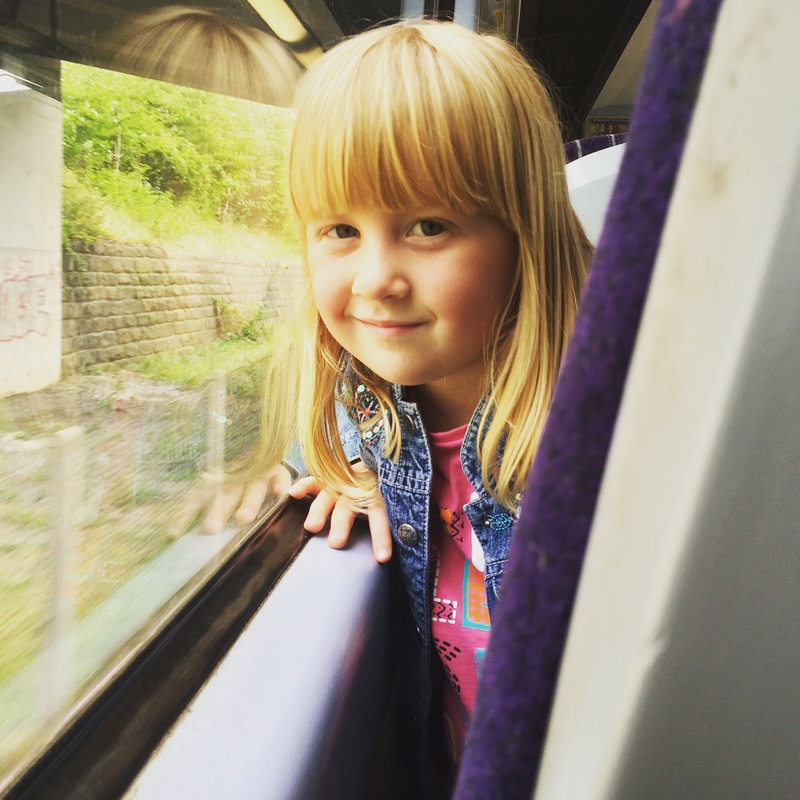 Therefore, as we stepped onto the train, my girl was bursting with excitement. Unfortunately, when she saw no Harry, Ron, Hermione or chocolate frogs bouncing on the seats, her enthusiasm faded somewhat. “Can I play games on your phone?” My girl asked the minute we began to move. No sooner had I said that and I saw some expletive language scrawled across the wall we were whizzing by and quickly handed her my phone in order to divert her eyes. I bet Harry Potter didn’t see the word ‘cockwomble’ emblazoned across a wall on his way to Hogwarts. Eleven minutes later and my girl, Grandma P and myself arrived in Leeds Train Station. Eleven minutes! I was very impressed. I don’t often get the train, so I made a mental note to mention this to the Other Half when I got home. Perhaps, on a rare child-free evening, we could catch the train into the cosmopolitan and vibrant city that is Leeds and treat ourselves to a few cocktails and some delicious food. Then I remembered that the Other Half doesn’t like cocktails, fine dining or socialising so I quickly scrapped the idea. It’s that damned ‘Othertownsilitus’ that he suffers from; he gets nervous and jittery when he leaves our precious little village. Well, that’s the reason he tells me when I complain that we haven’t been on a date in six years. Anyway, ‘why were you in Leeds?’ I hear you cry. Well, the reason being was that my daughter and I had been invited to our very first blogging event. My little blog sits steadily under the radar when it comes to making a living from it (I don’t), being recognised for awards and being invited to review products and events, which is fine because they were not my reason for starting to write. 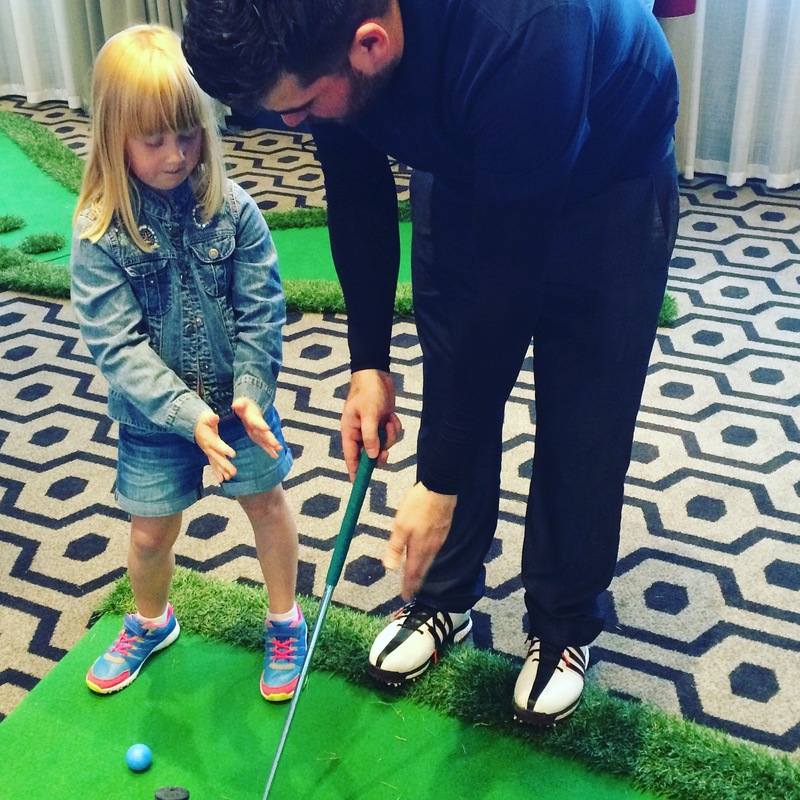 So when I received an email inviting my daughter and I to a golf event at the Hilton Hotel in Leeds with Online Golf, an on line golf retailer, I was a little chuffed. The Dude was staying at home with Daddy because the thought of him wielding a gold club around in a confined space was a little too much to handle. So, who else was going to come with me? Yep, that’s right. Grandma. Upon reaching her house, I was greeted with the now familiar sight of her surrounded by a load of contact lenses and looking confused. Way back in December, she had her eyes lasered and has had nothing but trouble since. “They have sent me more; I think these are wrong too. Can we just call at the opticians first? Therefore, once we arrived in Leeds, our first destination was not the Hilton, it was an opticians. To cut a boring story short, the heavens opened while we were inside being taught our left eye from our right eye and were caught in a downpour on route to the hotel. Not looking too dissimilar from a drowned rat when we arrived, we were greeted, welcomed and offered a drink before the activities started for the day. 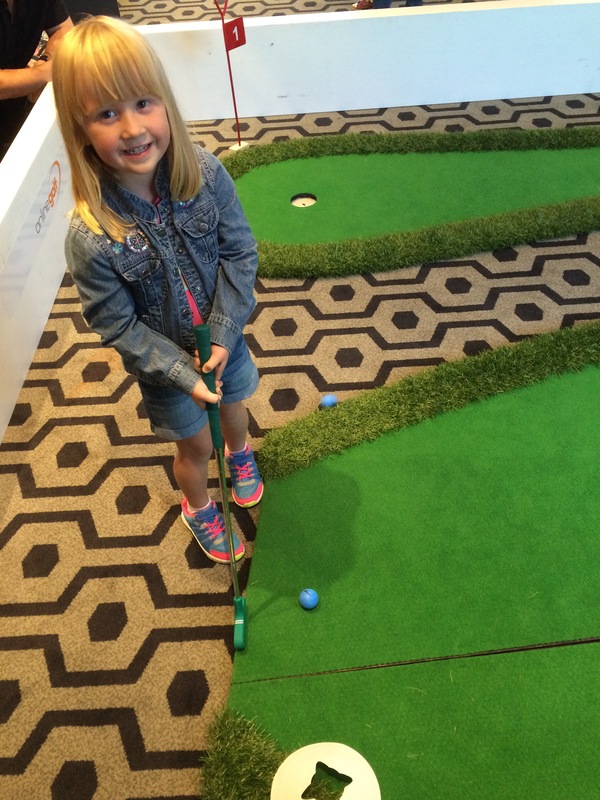 Before long, we were ushered into another room that was filled with lots of different golfing activities. We were introduced to the team running the event and the children all split up to trial different activities. In my opinion, my girl chose the most difficulty activity first. My Mum scolded me and told me to let her have a go because she would never learn otherwise. 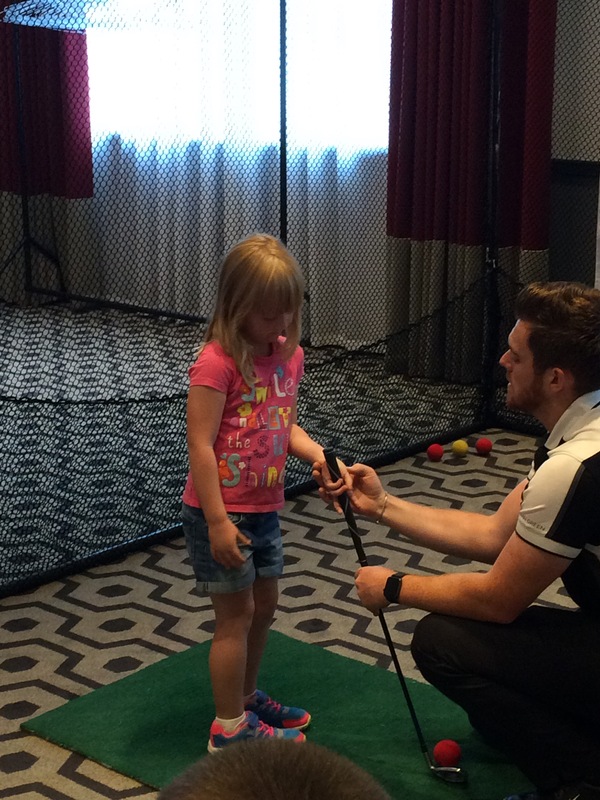 A very friendly instructor spoke to all of the children and explained, in detail, how to hold a golf club and what they needed to do in order to score top points in the game. Once the explanations were finished, it was time to have a go. All of the children waited patiently for their turn and put their hands up when they wanted a go. Some of the older children had a go first and they proved that the activity was indeed quite difficult. I found it hard to imagine my four year old being able to do it any better. She didn’t prove me wrong. Walking precariously up to the instructor and the tee, he explained patiently once again how to hold a club. My girl just stood with her hands out clearly not knowing her left from her right. 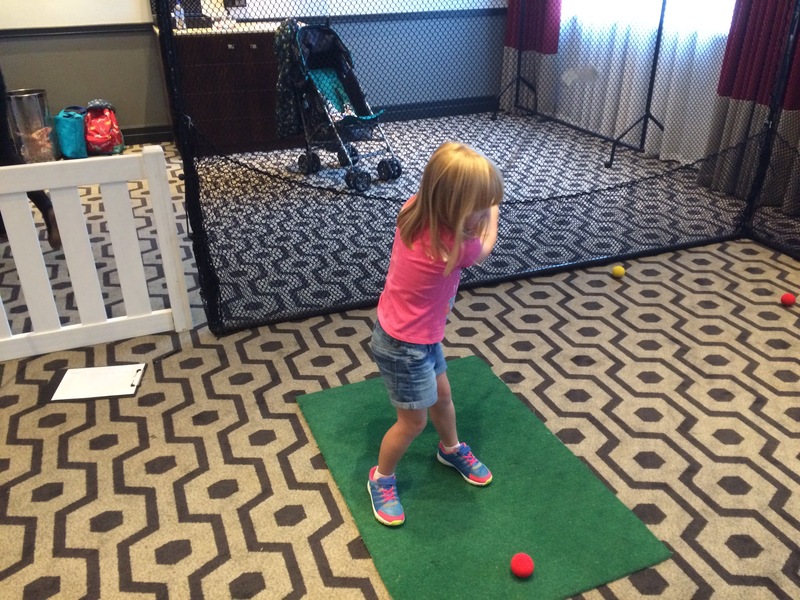 Maybe I ought to teach her that essential piece of knowledge at some point… Nevertheless, she was eventually holding the club and was ready to swing. Being taught for the first time how to hold a club. She swung a third time. She hit the ball; it rolled off sideways into the net. She was pleased though and ran over and high-fived me. I bet Rory McIlroy is shaking in his golf shoes. I think she hit the next ball although I can’t be sure. As all this was going on, another blogger came over and introduced herself. “I like your fringe,” she said. Reaching for my now curly and frizzy bangs, I told her that it was in desperate need for a trim. Bearing in mind that I now resembled the blonde version of Monica ‘it’s the humidity’ Gellar, I wasn’t 100% sure that she was being serious with me. The beautiful Yorkshire summer ruined my hair. The lady assured me that my fringe looked cool and I was happy to have met a fellow Yorkshire blogger who appreciated the dishevelled look I was sporting. By this time, the children had rotated and changed activities and next up was the opportunity to knock some foam pins down with a golf ball and putter. I thought my girl was much better suited to this activity as it looked much simpler than the last. Well, I was right about it being a bit easier. I was wrong about my girl being better at it. Eyes on the ball, not me! In the few minutes that she had left one activity, she had forgotten how to hold the club. Once again, another very patient and friendly instructor told her what to do. You know how this goes. No pins went down, but Mummy did catch one as it veered off through the air. The instructor asked how many pins she knocked down. Next up was Crazy Golf. Yes! She had played this before. She would know what to do. How do you hold it again? Once the activities had finished, we were treated to lunch and given a little gift bag. 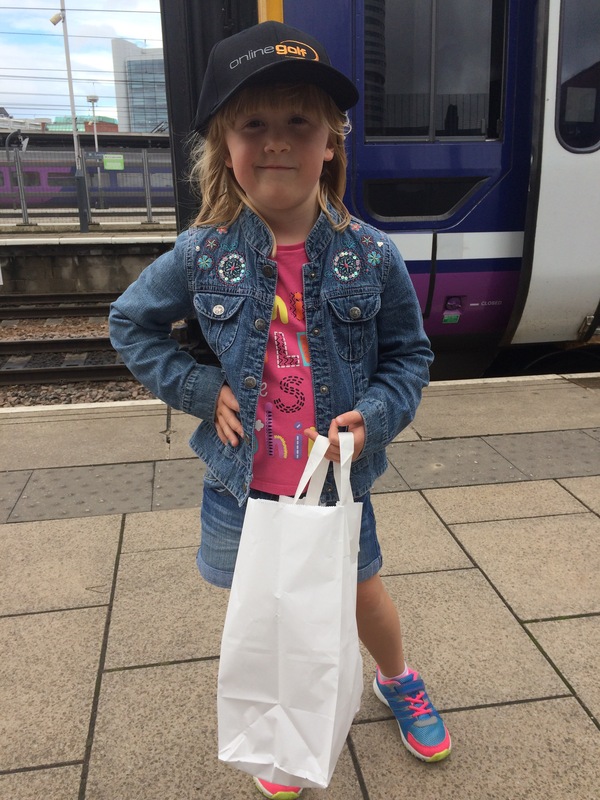 Donned in her new golfing cap, we made our way back to the train station. “Is the adventure almost over?” my girl asked. She nodded and soon enough we were on the train and moving again. Then the familiar questions started once more. Reluctantly, I handed her the phone. This post was written in collaboration with Online Golf.